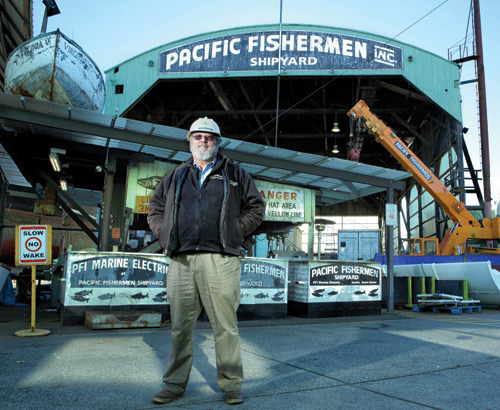 Doug Dixon joined Pacific Fishermen Shipyard nearly 14 years ago to keep the legacy Ballard business afloat. His professional career covers several aspects of the maritime industry, from oil drilling to boatbuilding. Much of his time these days is spent making sure “PacFish” has the capacity to survive in a booming Seattle neighborhood that is becoming less gritty and less blue collar by the minute. The blunt, outspoken Ohio native also has a preservationist streak. He collects icons from Ballard’s recent past — neon signs and artifacts from shuttered taverns and restaurants — to decorate the shipyard grounds, where he likes to entertain employees and customers with “authentic Norwegian barbecue” of alder-smoked salmon and cod. EARLY YEARS: I was born on the shores of Lake Erie in the 1950s. My dad was a manager at the Chevy plant in Cleveland, making transmissions. My mom was a schoolteacher. My two brothers are both engineers. One went to Purdue. One went to [the University of] Michigan. I joined him at Michigan and got a degree in naval architecture and marine engineering. FIRST JOBS: I got a job at Global Marine in Los Angeles drilling for oil and was associated loosely with the Hughes Glomar Explorer that picked up the [sunken] Russian submarine off the coast of Hawaii [in 1974]. I went from the oil patch to king crab in Seattle, working for Marco Seattle, which was famous for applying hydraulics to machinery and building vessels. I was a construction engineer and naval architect for boats like the Northwestern from [TV’s] The Deadliest Catch. [From 1991 to 1996], I worked in Norway for Det Norske Veritas as a surveyor for a lot of the factory trawlers it converted. After working in the surveying business, I went back to naval architecture with Guido Perla & Associates [in 1997] and then went on to run Pacific Fishermen Shipyard in 2001. THE SHIPYARD: Pacific Fishermen Shipyard was founded in 1946 by 400 Norwegian-heritage fishermen and their wives who plunked down $300 each to buy the old Ballard Marine Railway, which had been in operation since 1872, starting as the T.W. Lake Shipyard. I was hired to do a turnaround because they were having some difficulty. They said, “Don’t worry about the financials; you just need to worry about getting work in the door.” Then I opened up the books and discovered that instead of losing $250,000 for the year, as I had been told, we had actually lost a million. TURNING THINGS AROUND: I found that my first nine months on the job weren’t involved with going out and selling; they were spent putting tourniquets on veins and arteries that were spewing dollars. We borrowed a half-million dollars from the shareholders to keep things above water. By 2004, we got the value of the share price up to $2,000, so I said, “Let’s issue 250 shares at $2,000 each and retire that shareholder debt.” There was an argument over that, of course, but I won the argument. Then we went and did some acquisitions. We bought Lunde Electric [in 2004]. We bought the assets of Marco Marine Construction & Design as they dissolved their shipyard here. We bought some of the assets of Duwamish Shipyard when they dissolved, and also Union Bay Fabrication. All for cash. STEADY GROWTH: When I took over, we were just under $3 million in sales. Last year , we had a $14 million year. We expect to level off at around $12 million. Our profit is a million and a half before taxes, so we’re stuffing $600,000 [a year] in our jeans. We pay bonuses and we pay dividends. Our latest dividend was $225 a share and our latest share sold for $7,500. THE BUSINESS TODAY: Ever since 1872, this has been a shipyard. It built sternwheelers for [early Seattle entrepreneur] Joshua Green, built the world’s largest tug in 1925 for Hawaiian Tug & Barge, went on to build minesweepers during the [Second World] war, one of which became Jacques Cousteau’s Calypso and another John Wayne’s Wild Goose. After the war, it built smaller seiners and then progressed to building crab boats for the Bering Sea. Today, we are primarily a repair yard with about 70 employees at our peak times. About 55 to 60 are union employees in five trades: machinists, shipwrights, boilermakers, dry dock crew and electricians. About 50 to 60 percent of our work is on fishing boats, but we are also the dry-dock agent for Victoria Clipper and many of the tugboats around Seattle. CHALLENGES: Running the shipyard in a city atmosphere is difficult because of city taxation, city rules, the “socialist” movement that’s going on right now, bicycle paths going through industrial areas, freight mobility problems, and storm water issues on the state and federal level. But we’ve licked those. We spent money to put in process plants to take care of our storm water. We’re putting back [into the ship canal] storm water with less copper in it than our drinking water contains. If I stood on my dock with a hose containing Seattle drinking water, I would go to jail for a year and pay a $10,000 fine for each day that I had that hose running into the ship canal. Our [treated] storm water is cleaner. OVERZEALOUS REGULATION: We have rules set down by the EPA and we follow them. Same thing with OSHA and WISHA. But sometimes the process is overwhelming. If we break a steel rail and have to take an underwater hammer to put in some more rivets or have a welder do a little underwater welding, we’re actually obliged to hire a biologist [to gauge the environmental impact] on some nesting eagles up at Northgate. Am I going to spend $2,000 or $3,000 or $4,000 to hire a biologist every time we do that? No. I’m just going to make the repair. Call it civil disobedience. OPERATING IN A GENTRIFYING NEIGHBORHOOD: From just a financial standpoint, shares now trading on the market have an established value of $7,500. If we just look at the tax value of the land, the share value is probably $10,000. If you look at the true marketability of this thing as condos, it would be $25,000 a share. But the board of nine that runs this place — three members in and three out each year — is vetted to ensure that no one gets on the board that wants to do anything other than have a shipyard just like their grandpappy had and that their grandkids can see in the future. So that $25,000 in condo value will never be realized here. At least, not in my lifetime.